I'll back-track a little since folks have been teling me, ok, I got the idea of how to write a novel first draft in 6 weeks, but what would I write about? I can't come up with an idea like you. I can't just pull it out of thin air one morning. I can't coax it out of my imagination at a snap of my fingers! And I tell them, yes, you can. And I tell you, YES, YOU CAN. Here is how. Take a day off. Turn off your phone, close the door, make yourself a cup of coffee, or go sit in the park on your favorite bench. In other words, find a place where nobody will bug you for a whole day. Oh, and pack a pen and a pad of sticky notes with you. Do NOT take a notebook - a sticky note is small for a reason. Get naked. I don't mean stripping in front of the mirror (or in public) and admiring (or not) your curves (or else). Although, I hear it helps people boost their self-esteem (or not). What I mean is, dig deep inside of you. Get naked. Strip the layers of protection and find that one topic that has disturbed you over the years. Something that you don't want to talk about, others don't want to talk about, nobody wants to talk about (well, maybe a few people do), but it's something that elicits a strong emotion out of you each time you think about it (that's a lot of "abouts" in one sentence, but you get the point). For me it was the issue of teenage suicide (not many people like talking about it), particularly, based on the relationship of a father and a daughter (even less people like talking about it). Anyway, pick something that happened to you or to your friend or to someone you don't know (they were on the news). It could even be the latest scientific discovery that made your heart race. All of us have several stories like these. Now, write it down on a sticky note. Jump on stage. This is the most important part. If you're a beginning writer, don't try to pretend to be someone else, make your main character YOU. You know yourself better than anyone else (you would be the protagonist). You can switch genders if you like, but I'd advise against that. Now, pick the antagonist (whoever it is in that incident who did something nasty - the 'bad' guy). Two characters is enough. If you want to, add the third, maybe it's a love interest, or a talking plant as a side-kick, or a distant aunt who always bothered you on some deep deep level with her birthday presents. Only, remember, ALL characters have to be introduced on the first page, or at least in the first Chapter. If they are not relevant to the story - don't put them in it. So, now have two (or three) main characters. Write them all down on a sticky note. (Ok, ok, you can add more - but if you're a novice like me, it's a heck of a job to try and keep track of them all. I started with 32, in case you were wondering, down to 3 now). Play dressup. Literally. Now that you have decided on the characters, make them act the part. They are on the stage, including you. Remember, you're the protagonist. Think about the new 'you'. Think about that incident that happened. How old were 'you'? Where did 'you' live? Where did 'you' go to school? Who were 'your' parents? What did 'you' wear? Maybe even decide on the actor/actress who would be perfect to play 'your' part (when your book makes it into a movie). Do the same for the other two characters. Make a sticky note for each. (You should have four ot five sticky notes at this point - one for the incident, one for two (or three) characters, one for each character). Up the drama. That's what storytelling is about. Emotions. Drama. NOT facts. If we want facts, we go read the newspaper. Here is how you 'dramatize' your idea. The very first opening chapter should be the conflict between the protagonist and the antagonist, that one disturbing/funny/sad/exciting thing that you picked to write about (maybe the third character spies on them). For example (totally random): a cat fights a dog for a scrap of food. Now, in each consecutive chapter, you would have to UP the drama. Second chapter, two cats fight two dogs over two scraps of food. Third chapter, three cats fight three dogs... you get the drift. The chapter before last should be... drumroll... a pack of a hundred cats fights a pack of a hundred dogs for a pile of a hundred dead mammoths! The leader of the cat pack and the leader of the dog pack are, of course, the very first cat and dog you mentioned in the first chapter. At the end of that chapter the protagonist wins (of course, we all know that already). No offense to dog people, let's say, the cat wins! The last chapter is all about the cat telling other cats - man, that was an awesome fight. So, now you know how your story is going to end. Write it on a sticky note. (Of course, I'm being overly simplistic here, but the goal here is to get you to DO IT - you can learn about how to write a novel later, when you have a solid idea). Now, see if you need to adjust the very first sticky note according to the last one? Does the ending change the beginning? Maybe. 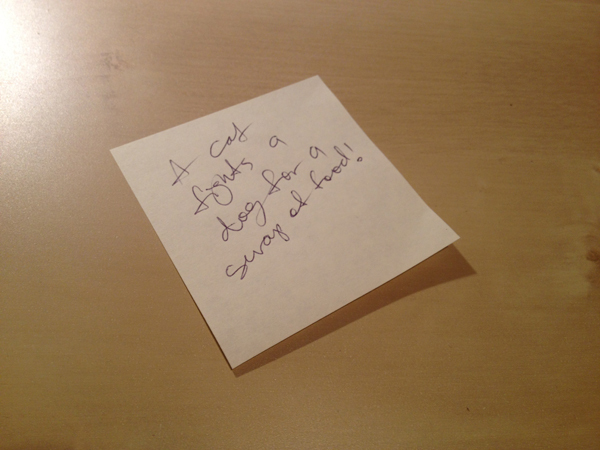 If it does, write a new sticky note with the final idea, throw the rest out. Repeat. See how easy it is? Now, repeat the process. I bet you by the end of the day you'll have ONE very solid idea for a novel. Share it here in the comments, if you'd like. Fire the naysayers. After coming up with an idea you'll probably be bursting to share it with the world (I know I did). Beware. There will be people who will tell you - are you out of your mind? You? YOU? You can't write a novel, forget it. You can't even string two sentences together! Here is what you do - you fire them. You tell them to go take a hike. You show them your tongue, just like in elementary school, or you show them something more R-rated. Whatever your style, DO NOT LISTEN TO THE NAYSAYERS. Fire them. Trust your gut. If your idea makes you emotional, write about it. You've got a story there, and the world can't wait to hear it.